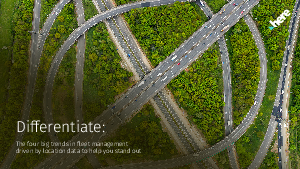 Discover the four big trends in fleet management being powered by location services. Trends to help you differentiate your solutions and enable transportation companies to overcome their logistical challenges and increase asset utilization. Discover what’s making the biggest impact, together with how, by integrating some of these trends into your solutions, you can position yourself as the service provider of choice in fleet and transportation management solutions. And find out how HERE is delivering features, from comprehensive mapping capabilities and real-time location data, to truck-specific attributes, to help you do just that. Complete the form to the right to receive the ebook today.